Fifth seed Petra Kvitova became the latest big name in the women’s draw to crash out of the US Open when she lost to Aryna Sabalenka 7-5, 6-1 at the Louis Armstrong Stadium on Saturday. The exit of the Czech, who reached last year’s quarter-finals, leaves only three of the top 10 women’s players in the running, with defending champion and world number three Sloane Stephens the highest ranked player left in the draw. Kvitova beat Sabalenka in three sets at the Miami Open earlier this year but the often error-prone 20-year-old Belarusian showed she had tightened up her game considerably since that encounter. Sabalenka made 15 unforced errors to Kvitova’s 35 and won 80 percent of her first serves as she wrapped up the victory in one hour and 25 minutes. She overpowered the twice Wimbledon champion from the back of the court too, winning 49 points from the baseline compared to Kvitova’s 27. “I really like to play on the big stages,” Sabalenka said courtside. “I really like to feel the support of the people. I didn’t expect anything, I just went on the court and tried for every point and now I’m so happy. Kvitova’s defeat capped a bad day for the top seeds at Flushing Meadows with fourth seed Angelique Kerber, sixth seed Caroline Garcia of France and 10th seeded Latvian Jelena Ostapenko all failing to progress. The quartet’s exit follows that of top seed Simona Halep in the first round and second seed Caroline Wozniacki in round two. There is still plenty of bite left in draw, however, with six-times champion Serena Williams firing on all cylinders and set to take on Halep’s vanquisher, unseeded Estonian Kaia Kanepi, in the last 16 on Sunday. Fourth seed Angelique Kerber’s bid for consecutive Grand Slam titles ended when 29th seed Dominika Cibulkova defeated the German 3-6, 6-3, 6-3 in the third round. >Momentum shifted firmly in feisty Cibulkova’s favour in the third set when she broke to take a 4-2 lead and held for 5-2. “I had my chances, but I couldn’t take them, especially in the third set,” Kerber told reporters. Cibulkova faces last year’s US Open runner-up, American Madison Keys, in the fourth round. Keys leads Cibulkova 4-0 in head-to-head meetings. 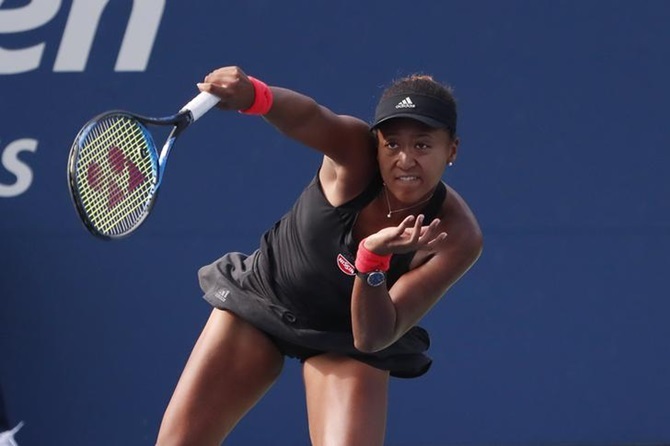 A ruthless Naomi Osaka crushed Aliaksandra Sasnovich 6-0, 6-0 to reach the fourth round for the first time. Czech teenager Marketa Vondrousova upset Dutch 13th seed Kiki Bertens 7-6(4), 2-6, 7-6(1) to reach the fourth round, becoming the youngest woman remaining in the main draw. Bertens had been expected to win her ninth match in a row after capturing the Cincinnati Masters title two weeks ago, a run that included victories over the world’s top two players Caroline Wozniacki and Simona Halep, but the 103rd-ranked Vondrousova refused to get overawed by the occasion. Vondrousova was one of a record six Czech women to have reached the third round of this year’s US Open. Maria Sharapova continued to enjoy working the US Open night shift with a 6-3, 6-2 humbling of 10th seeded Latvian Jelena Ostapenko, improving her record to 22-0 under the Arthur Ashe Stadium floodlights. There is no denying Sharapova's love for the big stage or the New York crowd's love for her and the five-time Grand Slam champion admitted that she feeds off the buzz. "I love the atmosphere. I love that they know how to cheer hard. I thrive on playing under the lights for some reason. I love that." Ostapenko, who was the runaway leader in double faults at this year's final Grand Slam, had three alone in her opening service game but was not punished for her sloppiness with Sharapova unable to convert any of five break chances. Eventually Sharapova would cash in on Ostapenko's generosity with the Latvian offering up 11 break opportunities and the Russian converting three - more than enough to take the first set. The 31-year-old will meet Carla Suarez Navarro in the last 16 after the Spaniard upset French sixth seed Caroline Garcia 5-7, 6-4, 7-6(4). Hard-hitting American Madison Keys overcame a slow start to beat Aleksandra Krunic 4-6, 6-1, 6-2 in the third round and move a step closer to a return trip to the final.